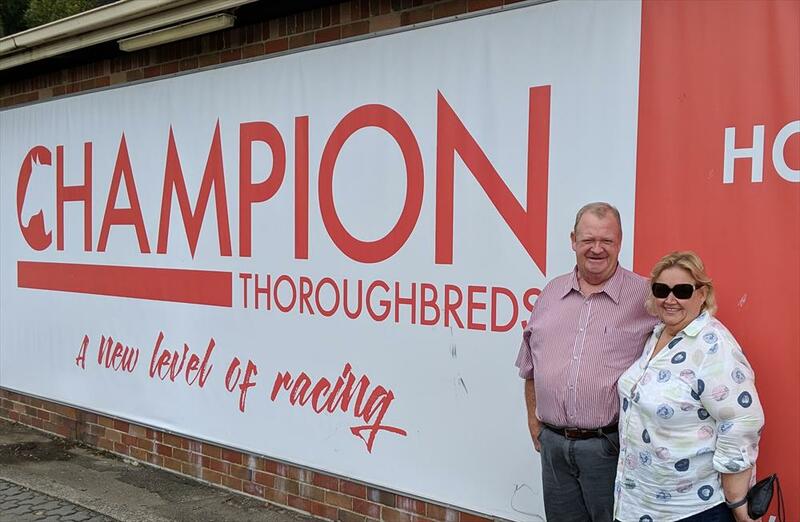 “What a great idea…we should get involved” were the words that Elizabeth O’Neill said to her husband Dave when Jason Abrahams mentioned the 1 in 5 Club at the recent Champion Thoroughbreds Open Day last month. And as any good husband does, Dave agreed and they are now members of the Exclusive Champion 1 in 5 Club. Last year, David and Elizabeth, bought into our stunning So You Think filly, Bonita Bella, then into the cracking Epaulette filly, Mai Time, and finally into our trial winning Charm Spirit filly, Enamour. This year after telling us he had enough horses he purchased a share in the stunning I Am Invincible x Dwindle filly. Dave and Elizabeth obviously love their time at the races because now they have ownership of 5 more cracking horses joining the exclusive Champion Thoroughbred 1 in 5 Club which gives them another 1% ownership of a stunning Press Statement x Thinking Of You filly, a Contributer x Minnaleo colt, a Sacred Falls x Pinata filly, a Toronado x Chabaud colt and another share in the I Am Invincible x Dwindle filly. Elizabeth really liked the concept as it spreads your risk and you get to own and race and enjoy the benefits of owning some very nice animals. “it’s a really good concept and really appealed to us. We love going to the races and we will be doing a lot of that in the future” said Elizabeth. “Sometimes it is really difficult to pick between the horses and this way you get an interest in all of them. I mean how difficult is it to split the Contributer and the Toronado colts?. This way I get to own and race them both”. It really is great having owners like Dave and Elizabeth who have become a big part of the Champion Family and friends of ours. We are delighted to have Elizabeth and Dave involved and together with other clients who have join the club we are looking forward to this group of horses hitting the tracks.